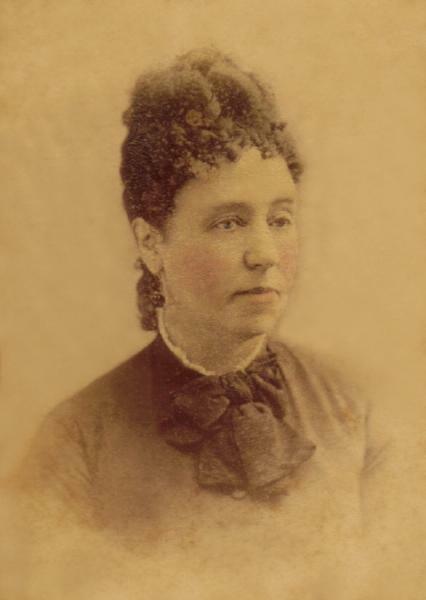 Josephine Caroline Brooks was born circa 1835 in Georgia. Hiram Wheeler Brooks and Sarah Eason Mitchell appeared in the US federal census of 1 June 1850 in Franklin County, Florida, and also in the household was Robert Thomas Brooks, age 30, probably a brother of Hiram.. Other members of the household included Josephine Caroline Brooks. She married Thomas Parsons Tainter, son of Benjamin Tainter and Deborah Merritt, on 15 May 1851 in Florida. On Wednesday, 18 January 1860, Green Wood recorded in his plantation daily account book: "Mr. Tainter and wife from Apalachacola Florida came on a visit. Mrs. Tainter was Josephine Brooks & grand daughter of my sister Betsey Mitchell." And on Thursday, 16 February, "Mr. and Mrs. Tainter left." Thomas Parsons Tainter and Josephine Caroline Brooks appeared in the US federal census of 1 June 1860 in Apalachicola, Franklin County, Florida. Other members of the household included Charles Brooks Tainter, Alice D. Tainter and Josephine Mitchell Tainter. Your letter so full of kind words deserved an earlier answer; but I trust when you hear my excuse, that your censure will be light. I received your letter a fortnight before leaving home; and just at that time - every moment was occupied in making preparations to leave - Indeed as soon as I returned home, I was over eyes in work, & could scarcely see my way through until I left. Since I have been away from home, little things have daily transpired to prevent my writing. But I hope dear Aunt - after reading this - you will not impute my long silence to intentional neglect. I will hereafter endeavor to be more punctual in responding to your kind letters. I was very sorry to hear you had been sick; I hope after going to Sour Lake, you returned home entirely restored to health - As so many friends accompanied you there - you must have had a nice time - how did Miss Sarah like it. My husband & myself often speak of you & Uncle with affectionate interest - we regret that we did not see Campbell - I suppose he spent his vacation home - when will he graduate? When Uncle went to New Orleans - we felt quite vexed that he did not come over to see us - Ma said she would have given anything to have seen him. We passed a week in Columbus - before coming north - Aunt Frances eldest daughter (Sarah) graduated just before we got there - she is an intelligent & pretty girl - she is only sixteen. We did not go out to Uncle Solon's, as his wife was daily expecting an addition to her family - but we have not yet heard of its arrival. My husband wrote to Uncle a few days since - Soon after we returned home - Thomas commenced attending to his business; & made himself sick again. I warned him against doing it - but all to no purpose, he had determined to sell out so he worked very hard to arrange matters, so that he could. He does not expect to return to Apalachicola - as the climate is too damp for him - but where our future home is to be - he has not yet decided - his health is so uncertain that he scarcely knows what to do - When we return to New York - which will be in the course of two or three weeks - he will then determine upon something I have very little hope of his ever being restored to health -- his cough is very bad - but yet the Dr -- tells him that his lungs are not effected. Oh, dear Aunt - you can't imagine how sad I feel about him - this is my first trouble, & it is very hard to think that he must be taken from me - but I hope & pray God may yet restore him to health - he appears quite discouraged. I believe you heard me speak of this place - we have been here over two weeks - & find it delightful. It is a lovely place for children - mine enjoy it exceedingly - they are out at play - nearly all day; & they look so well - I wish you could see them - I know you would be compelled to say, that they are fine looking children, & the best behaved you ever saw - they bear this character - wherever we travel. I can imagine I hear you & Uncle say "of course Josephine thinks her children perfect" - no, I do not think so, at all - but as you have never seen them, I must give you some idea of them - so I hope you will excuse this spirit of boasting. The lake here is beautiful, & the scenery around, cannot be surpassed - I have a most lovely view (of the mountains which encircle the lake) from my window - The hotel is situated right on the lake, & the boats are free - so we go out rowing very often - I wish you could be here. It is very cool here - I have only worn a thin dress, once or twice since since I came - thick clothes are the most comfortable all the time; & we have had fine [sic] almost every day. Pa & Ma are now at Saratoga - but will be here in about a week - quite a number of Apalachicolans are here - so we find it very pleasant. Tell Ella I often speak of her to my children, & they have a great desire to see her, & all of you - I should like very much to have some of your good fruit - we get nothing but apples - they don't get good fruit in New York, until the first of Sept. How does Mr Powell progress in love matters?I suppose Mrs Eddie Williams will reside in Galveston next winter - it will be pleasant for [her sister] Mrs J Williams, Remember me kindly to Mrs Campbell - Fannie, & say to Mrs Williams (if she is at her mothers) I should like to see her now, with her babe - it must be quite a pet with all the family - Have you ever heard Mrs Campbell say anything about Rebecca's being engaged? It is believed by all, in Apalachicola that she is to be married to a Mr Beal there - but how soon we don't know - he is said to be a couple of years younger than she is - he is very highly esteemed by his employers; & I expect he will make her a good husband - How is Josie & Cousin Mary Jane? I think of them every sunday as going over to your house to dine - I should like to see you all together again - When my husband gets in a low spirited mood - I often wish that cousin Green could happen in, & chat with him - he cheered him so much last winter - he often speaks of him, & the kindness of you all - neither of us will ever forget it - You have no idea how much I love you, and Uncle I shall always remember my visit to you with pleasure - & I hope we shall have an oppor[tunity of see]ing you again sometime - & returning your hospitality. If I] was house keeping - it would give me so much pleasure to have you visit me. Ma often says, she wishes that you & Uncle would make her a visit, & I think you might too - but if we don't return home - I should miss seeing you - but I[ know Pa & Ma would give you a warm welcome - Does Miss Sarah take her favorite walk by the pig pen yet? or has she found a more attractive path - If you don't understand this - she will - My husband has gone off fishing this morning - he really ought not to go - but he gets tired of being in the house so much - I am afraid he will make himself sick. For a long time I have looked for a letter from you - but in vain. I have never received a reply to my last letter. While we were north - my husband received one from Uncle, & he mentioned that you would write one very soon - I have concluded that it must have been lost - as I cannot believe that you would intentionally neglect writing me. I have really felt quite uneasy, lest you or some of your family might be sick. Since I left your house dear Aunt - not a day has passed without my thinking & speaking of you & your family. I can never forget your & Uncle's kindness to us; and my mind will ever revert to the time we spent at your house with pleasure. You endeared yourself to me so, that I left you with an aching heart. I often wish that I could see you & I have a nice long chat. We returned home the last of November - but my husband did not come with us. He remained in New York two weeks after we left; and then he went out to St. Paul in Minnesota - He will remain there until spring - When I left him - his health was much better than it was last season & he looked remarkably well - but yet his cough troubled him. He now writes me that he never felt better in his life & his cough is improving. So I hope he may yet be restored to health. It is a hard trial to me, to be separated from him, but he thought it best for me to remain with the children this winter, as he was not sick enough to require my care. The climate of St. Paul is intensely cold & dry. In winter they have no rain. He says he stays in the open air nearly all the time, & the cold agrees with him. The Hotel there is very good, & he is comfortably & pleasantly fixed. He carried letters of introduction, so he had made many pleasant acquaintances. Tell Uncle that Mr Tainter writes us that Corn in Minnesota, is 35 cts per bush -- & Oats at 18 cts. He says they have the greatest quantity of all kind of wild game. It is said to be a delightful place in summer, so cool. I scarcely know what to write you that will be interesting, as secession is about the only subject discussed now. I am very sorry to say that our little state went out of the Union on the 10th inst - I hope she will yet be driven back - It is disgraceful that the Union, gained by the blood of our fathers should be broken & dissolved. War will inevitably be the issue of all this. As you are living in the country - I suppose you do not hear so much of the excitement. In our little city we see & hear a great deal, more than is agreeable. Tell Uncle I know that he had too much good sense to be a dis-union man. I hear that Uncle has become a firm believer in Spiritualism - Is this true? I suppose you have made great progress - since I was with you - I would like to look in upon you all, when you get seated around the table. You must write me all about it - I suppose Dr Stewart favors you with his presence occasionally. Not long since we heard of the death of Cousin William Mitchell - he died quite suddenly. Is Mrs Sallie Wood with you this winter? Of course Miss Sarah is with you, & I suppose as devoted as ever to her little school. Tell her I have learned to play Eucher & like it very much - I am sorry that I did not understand it last winter, as Miss Sarah was so fond of it. My two eldest children go to school & are learning very well. I wish you could see them. I often tell them about Ella & Wood. Is Mr Powell married yet? Is Campbell at College this winter? I regret that I did not see him - I hear no talk about Miss Rebecca Clark's getting married this winter - but I think she is engaged. Please remember me kindly to Mrs Campbell & her family. When I was in N. York I heard that Mrs Menard was to be married to a gentleman there, who is an Editor of reporter of some N. Y. paper - He is said to be worthless in every sense, and only wants to marry her because he thinks she is rich. I was told this by a person who knows him very well - I would have called on Mrs Menard - but did not hear that she was in the city - until a day or two before she left. Ma & Pa say that you & Uncle must visit us this season - we would be delighted to see you. After you get to Galveston the journey is not much; & I think you ought to come - It would do you good - Now dear Aunt do persuade Uncle to come. I imagine I hear him say that he is too old to leave home - but I say he is not, & he must come. It is just a year today since I arrived at your house - I would like to see you all this morning. I suppose Cousin William, Josie & Lina visit you as often as ever, & Cousin Green's family too - Give my love to all of them. Josephine Caroline Brooks became a widow at the circa 27 April 1864 death of her husband Thomas Parsons Tainter. Josephine Caroline Brooks appeared in the US federal census of 1 June 1880 in Morristown, Morris County, New Jersey. Other members of the household included Erastus Corning Abell, Alice D. Tainter, Frank Stone Tainter, Effie Brooks Abell, Charles Tainter Abell and Frank Dale Abell. Josephine Caroline Brooks appeared in the '1883-1884 Morristown, New Jersey, City Directory at Elm near South listed as widow of Thomas..
Josephine Caroline Brooks appeared in the '1897-1898 Morristown, New Jersey, City Directory at 11 Elm listed as widow of Thomas P..
Charles Brooks Tainter and Susan Dodge Curtis appeared in the US federal census of 15 April 1910 in Brooklyn, Kings County, New York, at 161 Congress Street. Other members of the household included Josephine Caroline Brooks. There was one boarder in the household. Josephine Caroline Brooks died on 23 February 1915 in Kings County, New York. She was interred at Evergreen Cemetery, Morristown, Morris County, New Jersey. The following appeared on 24 February 1915 in The New York Times: [Died] Josephine Caroline Tainter, only daughter of the late H. W. Brooks, Esq., and widow of Thomas Parsons Tainter, Esq., in the 82d year of her age. Funeral private from the residence of her son, Charles Brooks Tainter, Esq., Brooklyn, N. Y. Kindly omit flowers. Notice of interment hereafter. The following appeared on 25 April 1915 in The New York Times: (Morristown, N.J., April 24) Portraits in oil of George and Martha Washington from the brush of Gilbert Stuart, the famous Continental artist, are disposed of in the will of Mrs. Josephine C. Tainter, which was offered for probate today. They are bequeathed to her son, Frank S. Tainter, of Far Hills. The value of the paintings is not set forth in the will, but it is known that they are worth many thousands of dollars, and numerous high offers had been made for them. Mrs. Tainter's personal effects will be divided among her three children, the others being Charles B. Tainter of Brooklyn and Mrs. Alice D. Abell of this city.